Use questions to find out what your child knows about grammar. Do they know what a noun is? If not, show your child some objects. Explain that nouns are the names used for people, places and things. You can do the same with verbs by acting out some actions such as 'jump', 'hop' and 'clap'. Watch Charlotte's film 'Grammar: the basics' to find out more about what these grammatical terms mean. Play 'i-spy', with the focus on looking for nouns (e.g. dad, bridge, tree, shop, apple). Tell your child that you are going to ask questions about the noun they have chosen. For example, 'Is your noun green? ', 'Can your noun fit in my hand?' In this way you introduce grammatical terminology in a fun way. Do simple crosswords with your child using a dictionary to help you. The dictionary tells you what type of word you have looked up (verb, adverb, pronoun, noun etc. ), and you can share this with your child. If your child is unsure about how to spell a word, encourage them to sound the word out and write the letter or group of letters (the grapheme) represents each sound (the phoneme). Then they will realise that they know how to spell some, most or all of the word and you can help with any tricky bits as needed. If your child is unsure about how to spell a word, encourage them to sound the word out and write the letter or group of letters (the grapheme) represents each sound (the phoneme). Then they will realise that they know how to spell some, most or all of the word and you can help with any tricky bits as needed. When you read, occasionally look at the punctuation and talk about what it is telling the reader to do. Show your child how a question mark tells you to raise your voice at the end of the sentence to indicate a question being asked. Explore how you can show the 'feeling' behind an exclamation mark. Are the characters shouting, has something unexpected happened, has something gone wrong? Read some sentences and try to identify the verb, noun, adjective, etc. By becoming familiar with these terms, your child will become more confident at using them. Children often say 'could of' and 'would of' when they mean 'could have' and 'would have'. This is because the contracted (short) forms 'could've' and 'would've' sound very similar to 'could of' and 'would of'. Show your child the words in their full forms: 'could have' and 'would have', and get them to cross out the letters that are missing in the contracted form. In this way they will understand why 'could of' and 'would of' are wrong and will hopefully stop using them! Children in Key Stage 2 at school should be able to spell many words but some may still cause them problems. Look through your child's writing together and find the words that they often spell incorrectly. Choose no more than three at a time. Ask your child which bit of the word they find tricky to remember. In this way your child can focus on the small bit of the word they find difficult rather than the whole word. It's less daunting. For example, children often spell 'many' incorrectly because they hear 'e' in the middle of the word. So saying it in a different/silly way might help them to remember it. If your child says 'man- y' then this could help them spell the word correctly. Make up silly sentences to remember homophones (words which sound the same but have different spellings and meanings). For example, 'We'll need a new wheel' or 'I write with my right hand'. Play the sentence game. The aim of the game is to make the longest sentence possible. Two or more people take turns to say one word of a sentence. Whoever finishes the sentence is the loser. This game is very funny and it helps children use conjunctions or connectives to keep the sentence going, e.g. and, but, or, yet, so, then, after, therefore, finally. Children often battle with apostrophes. Sort out the most common error first. Children often mistake 'its' and 'it's'. Remember, 'it's' is the contracted version of 'it is' and it has the apostrophe to show that the 'i' of 'is' is missing. This is the only time 'its' needs an apostrophe. Then make these words into contractions: have not, will not, do not, does not, shall not and can not. Actually cross out the letters that are being omitted and then write the new word: haven't, won't, don't, doesn't, shan't and can't. Once these are clear then you can tackle apostrophes that show something belongs to someone (possessive apostrophes). When you are reading together, look at how authors use different sentence types for effect, such as simple sentences containing one clause (e.g. 'James picked up the spoon. '), short commands (e.g. 'Give me the spoon, James! '), or more complex sentences such as compound sentences ('James picked up the spoon and he ran away excitedly.') and sentences that have a subordinate clause (part of a sentence that doesn't make sense by itself, used to 'pop' in extra information about characters and situations, e.g. 'With great excitement, James picked up the spoon.'). Talk about different types of punctuation as well, such as question marks, exclamation marks, commas etc. Can your child identify ellipses? See how these are used to ramp up tension or to get the reader thinking. Show your child a tray of objects. Name them together and explain that all these words are nouns. Nouns name a person, place or thing. Ask your child to say their name. Explain that their name is a special noun called a proper noun. People's names have a capital letter at the beginning to show that they are proper nouns. Look for capital letters at the beginning of proper nouns, e.g. on a map for place names, or the address on a letter for people's names, street and county names. When you have one of a noun then it is singular: one cat. When you have two or more of a noun it is plural: two cats. Most plurals are made by adding -s or -es to the noun. But some are different: child becomes children; foot becomes feet; person becomes people. There are special nouns called collective nouns which describe a group of people or things, e.g. a crowd of people. Look at an animal book and explore the collective nouns. Make a list of the ones you find. Here are some you might like to tell your child: a murder of crows, a crash of hippopotami, a leap of leopards, a lounge of lizards, a tower of giraffes. An adjective adds information about a noun, e.g. a red hat, a tiny bird. Play guessing games that encourage your child to describe an object. Ask them to choose one of their toys and describe it to you. Make sure that you can't see the toy. Can you guess what it is from the adjectives they have used? Now describe an object for your child to identify. An adverb gives more information about a verb, e.g. shout loudly, play nicely. Play 'Crazy Adverbs' – one person is given a verb and adverb to act out, e.g. 'dance gracefully', 'spin quickly'. The aim is for the actor to dance/spin in such a way that others can guess what the adverb is. It might be worth modelling this game for your child by taking the first turn at being the 'actor'. Play 'Opposite World', a game where you use 'don't' to mean 'do'! For example, 'Don't give me a kiss!' = 'Give me a kiss!' Say an 'opposite' sentence to your child and see whether they understand it and can carry it out. Take it in turns, giving them the chance to make up some sentences for you. Expand the game to include antonyms (words that mean the opposite of each other). For example, 'up' means 'down', 'small' means 'big', 'quiet' means 'loud' etc. Again, take it in turns to say 'opposite' sentences to each other (e.g. Find me a small toy) and carry them out. Try using opposite adverbs, e.g. clap your hands 'softly' (meaning clap loudly! ), jump about 'slowly' etc. Make up some silly sentences using opposites, e.g. I love to eat worms! See who can make the funniest sentence. Show your child how a question is formed using question words such as how, where, when, what and why. Make up some questions together. You could try to find the answers too. Together, practise asking questions using can, will, could and would, e.g. 'Can you help me with the lunch? ', 'Will you bring me a cup?' etc. Now show your child how to turn the questions into commands . For example, 'Can you help me with the lunch?' becomes 'Help me with the lunch!' Point out the difference in punctuation at the end of a question and a command. Can your child change a question into a command? They can imagine they are a captain telling you what to do! Play 'Odd one out' – write a list of words with one word that is the odd one out e.g. the words are all verbs except one. Can your child find the odd one out? Can they say what types of words are in the list? Can they tell you what type of word the odd one out is? If your child finds it too difficult, give them a clue. For example: shout, sing, horse, flick, beg (all verbs except horse which is a noun); cute, small, delicate, bendy, sky, (all adjectives except sky which is a noun); teacher, mouse, ladder, Scotland, desk (all common nouns except Scotland which is a proper noun); quickly, silently, cautiously, dance, fast (all adverbs except dance which is a verb). This game is also appropriate for children ages 8+. Charlotte Raby has been a teacher for over 16 years. She is now a teacher trainer and works with schools to help them improve the teaching of all aspects of English, including grammar. In her films, Charlotte talks you through the basics of grammar so that you can feel confident helping your child with their homework, and suggests ideas for activities and games you can play with your child to support their learning. 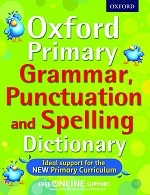 Charlotte also gives you all the information you need about the English grammar, punctuation and spelling test for children in Year 6. 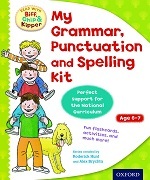 A grammar, punctuation and spelling test for children in Year 2 is in development for Summer 2016 so watch this space for further information as this develops. You can watch each film all the way through or, once the film has started, you can click on the links to the left of the film to skip to the part that is most relevant to you.